When the regular ritual of preparing your annual report rolls around, you may need a report that reflects a level of professionalism that cannot be produced by your in-house staff. At this point, you can turn to CFMC to produce a quality product, delivered on time and within budget. With lucid layouts, crisp graphics, and the latest design techniques, we produce annual reports that sizzle with eye appeal and content continuity. Contrary to conventional thinking, our annual reports go beyond serving as the disclosure function for current shareholders. That is a given. Wise companies, however, also utilize the annual report as a marketing tool to attract new investors, strategic partners and talent, as well as to influence opinion leaders. Accordingly, our goal is to clearly position the document as a strategic, forward-looking one that clearly distinguishes a company from its competition. Research bears out this approach. In a poll of approximately 300 institutional investors, more than half say that the annual report influences their investment decision. Accomplishments. We focus on results rather than activities. Focusing on a select few solid accomplishments rather than a myriad of activities, helps the narrative flow without getting lost in the weeds. Your Compelling Story. An organization's story is unique, so we tell it from a real person's perspective. Painting word pictures with a smattering of colorful anecdotes can ad some sizzle to your story. The Financials. While full disclosure is important, we simply summarize the highlights here and leave the details to the accountants with ample markers pointing the audience back to the actual financial statements. This approach beautifully balances presentation with disclosure. Ample Thanks. President Reagan said, "It's amazing how much can be accomplished when you don't care who gets the credit," so we make sure your key continents - like customers, employees, board remembers and others are adequately thanked for contributing to the accomplishments of the organization. A Call to Action. The immediate action items are set forth here. We make them clear, concise, and complete without overwhelming the audience with a tedious to do list. We leverage our expertise and proven approach across a wide variety of projects for public, private and non-profit organizations. Our clients range from investor relations officers to human resource managers to product marketing specialists. While the scale and scope of projects varies widely, the hallmarks remain the same—thorough research, strong conceptual development, compelling design and detailed production execution. 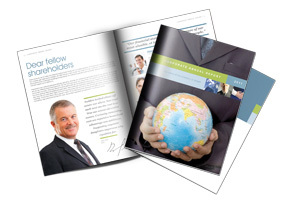 Contact us today to see how we can develop an outstanding annual report that will impress even the most discriminating shareholder.